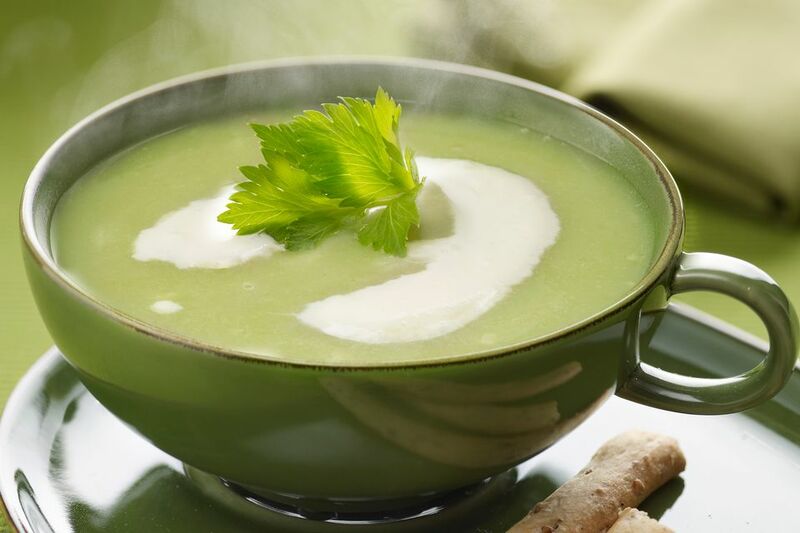 This classic cream of celery soup is beautifully aromatic. It makes a great first course and served with a nice crusty bread it's a meal on its own. Since celery doesn't have much starch in it, and since we don't use any other thickener, a single potato, peeled, diced and simmered along with the celery and other ingredients, is what gives the soup its thickness and body. But go easy on the potato. You're not making potato soup. You want about 200 grams of diced potato, which is roughly equivalent to the yield on a so-called "medium" potato after peeling. In case you aren't familiar, crème fraîche is very similar to sour cream, with one difference being the fact that unlike sour cream, crème fraîche won't curdle when it's added to a hot soup. Another easy but elegant garnish is toasted croutons made from day-old baguette sliced on the bias. Drizzle with olive oil and Kosher salt and toast in a 350 F oven until lightly golden brown. Note that I'm not going to specify what sort of fresh herbs to use. Use whatever you've got. Parsley is great. Chives, thyme, even fresh mint—all good. Peel the celery stalks with a vegetable peeler to remove the long stringy fibers from the outer edge. Then cut it into chunks about an inch square. Peel the potato and cut it about the same size. In a heavy-bottomed soup pot, heat the butter over medium heat. Add the onion, garlic and celery and cook for 2 to 3 minutes or until the onion is slightly translucent, stirring more or less continuously. Add the sherry and cook for another minute or two or until reduced by about half. Add the stock and the potato. Increase the heat to medium-high and bring to a boil. Then lower the heat and simmer for 15 minutes or until you can pierce the potatoes with the tip of a sharp knife. Remove the soup from heat and purée with an immersion blender or a regular blender. Return the puréed soup to pot and add more broth or stock to adjust the thickness if necessary. Season to taste with Kosher salt and celery salt, ladle into individual bowls, garnish with crème fraîche and serve.